Black holes, neutron stars and supernova remnants won't be able to hide in the fog of space for much longer. NASA's Nuclear Spectroscopic Telescope Array (NuSTAR) mission — which is due to launch sometime this spring, though the agency has yet to pin down a date — will pierce the dust and gas shrouding sources of high-energy X-rays, revealing many secrets they have long managed to conceal, scientists say. Although telescopes such as NASA's Chandra X-ray Observatory have probed the skies with X-rays before, these other instruments have focused on lower-energy bands. The NuSTAR mission's increased sensitivity will allow it to probe the hearts of other galaxies for some of their most violent and mysterious objects, such as black holes. Black holes form when a dying star collapses in on itself. As the stellar remnant becomes smaller and more dense, its gravitational pull becomes so strong that not even light can escape. But as dust and gas fall inward, friction and other forces heat the material to millions of degrees. The resulting X-rays, detectable to NuSTAR, should allow astronomers to calculate how fast black holes are spinning, and understand more about how they formed, researchers say. Some material also shoots away from black holes in jets approaching the speed of light. The accelerated particles can vary in brightness over the course of time, and NuSTAR will be able to study how they change. While NuSTAR will study some black holes in distant galaxies, it will also make observations closer to home. "There is a black hole that's four million times the mass of the sun at the heart of the Milky Way," Harrison told SPACE.com. "It doesn't emit a lot of radiation, for reasons that are somewhat mysterious." Occasionally, black holes "burp" or "hiccup," giving off a burst of radiation for unknown reasons. Observing the black hole in the high-energy X-ray spectrum should provide more clues about how this local black hole works, researchers say. Black holes aren't NuSTAR's only targets. "We're also looking at the remnants of stars that have exploded," Harrison said. Called supernova remnants, the leftover guts of stellar objects can reveal insights into the inner workings of massive stars before they blow. "We can still see [the material] glowing with radioactivity," Harrison said. The radioactive leftovers can tell scientists about how the star exploded, and how the materials inside them were formed. Since all elements other than hydrogen and helium were created inside stars and spread into space by supernova explosions, such insights can provide clues about the formation and evolution of the universe, researchers say. High energy X-rays are tough for scientists to work with because they are so difficult to measure, Harrison said. "The energy range we're talking about for X-rays is the same energy range your doctor or dentist uses to image through skin and see your bones," she said. "High-energy X-rays — or X-rays in general — will only reflect off surfaces at very glancing angles." Harrison compared this reflection to skipping a stone off the surface of a pond. Instead of a flat surface, NuSTAR uses 133 nested shells in each of two telescopes. Like Russian dolls, the shells — which are each about as thick as a fingernail — lie inside of one another. As X-rays pass between the layers, they are guided down to the detector. In comparison, Chandra has only four shells, and each one is approximately 1 centimeter thick. The increased number of shells makes NuSTAR 10 times sharper and 100 times more sensitive than any previous high-energy X-ray telescope, all in a compact, 33-foot (10-meter) package. 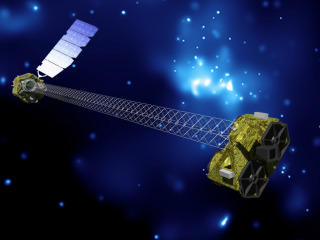 "NuSTAR is going to be a tremendous breakthrough, but it's also done on NASA's smallest astrophysics platform, Small Explorers," Harrison said. "It shows you can still do unique and new things on small missions."